This World Cup, the action will not just be on the pitch - it will be on YouTube too! All of the countries chasing the trophy (except for Iran and Saudi Arabia) have accounts on the video platform.  Most of these accounts are for the countries' national federations and associations, but some of them actually represent the national soccer teams themselves. 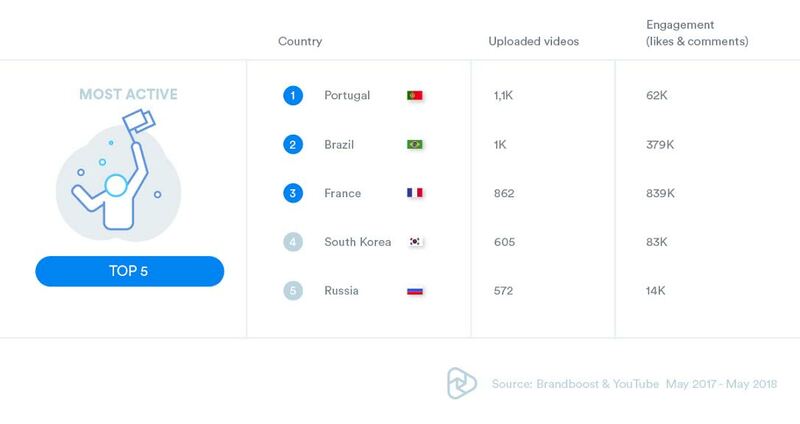 This is the case for Spain, England and Germany, among others, as shown by a study conducted by Brandboost by Divimove, the online video creative agency of Divimove, using YouTube data. Combined, the 10 countries with the most subscribers to their channels have over 2 million subscribers. France (656,000), England (534,000) and Poland (506,000) are at the top of the table, followed by Brazil (275,000), South Korea (81,000), Germany (64,000), Japan (55,000), Spain (45,000) and Argentina (33,000). This reflects growing demand among people who use online video as a way to keep up with the latest sporting news. In fact, demand is now so strong that the oldest of all the channels included in the study, namely England's, uploaded more than 380 videos in 2017, compared to just 52 in 2010 - the year the channel first became active, despite being created in 2006 - and is gradually beginning to include YouTube proprietary formats. 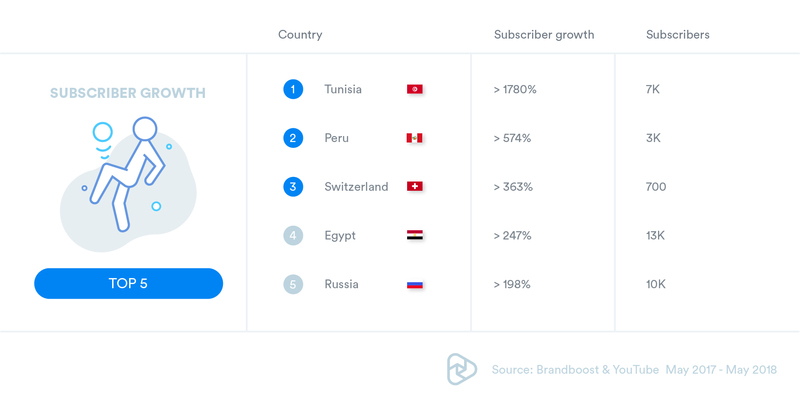 Tunisia is leading the way in terms of subscriber growth: over the last 12 months, the number of subscribers to Tunisia's channel grew by 1,780% to reach 7,000. The video that kicked off the increase was the video of the friendly with Costa Rica, which featured images of the match itself, the training session and the build-up to the match. The channel gained over 700 subscribers in the days after that video was published. Although the channel does not follow a regular posting schedule, its subscriber growth shows that knowing your audience and producing up-to-date content that suits their tastes is a recipe for success on YouTube. 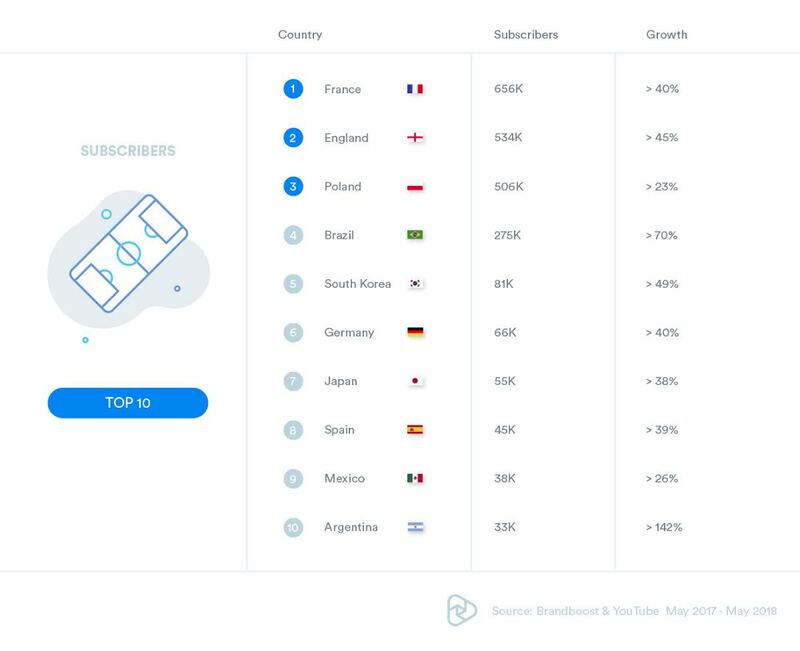 Other countries with high subscriber growth rates include Peru (574%), Switzerland (363%), Egypt (247%) and Russia (198%). For the purposes of this study, we looked at the channels of the national teams representing Spain, Argentina, Nigeria, Australia, Germany, Mexico and England. We also looked at the channels of the football federations or associations of the countries that are taking part in the World Cup but do not have a specific channel for their national teams. The channels' success was measured by the absolute number of subscribers and the growth in subscribers. Unlike video views, which are generated in part by paid pre-roll campaigns, subscriber numbers are a very accurate reflection of organic reach and brand growth on YouTube. Finally, the data for the study were gathered between May 2017 and May 2018.